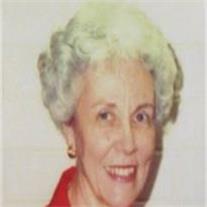 Marion Jones Harris, 88, passed away peacefully March 14, 2013 in Mesa, AZ. She was born on February 12, 1925 in Provo, Utah. She was active in her church, loved to crochet afghans, make Christmas ornaments, and collect thimbles and spoons. She is preceded in death by her husband, Virgil, and a great-granddaughter. She is survived by her children, Ron, Gail Merritt, Pat Talley, and Hilton, 16 grandchildren and 29 great-grandchildren. Viewing will be Friday, March 22, 2013 from 6-8 PM at Bunker’s Garden Chapel, 33 N. Centennial Way, Mesa. Funeral services are Saturday, March 23, 2013 at 10 AM, preceded by a visitation at 9 AM at the LDS Chapel, 1852 N. Stapley Dr., Mesa.